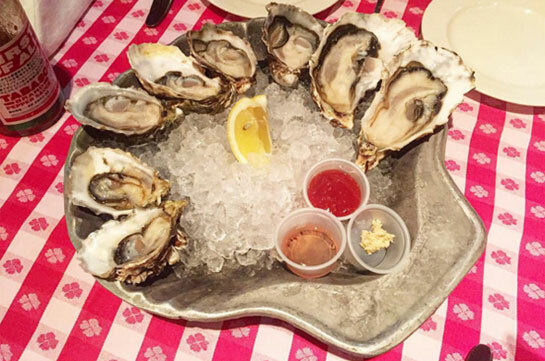 For over one hundred years, The Oyster Bar has served the freshest seafood to New Yorkers, celebrities and dignitaries, alike. This is our story. 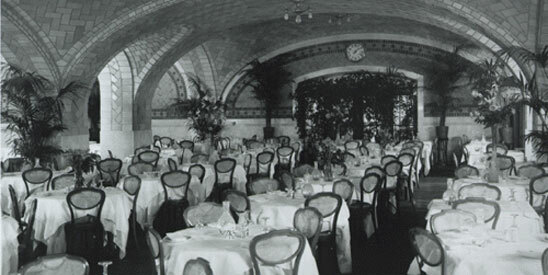 The Oyster Bar first opened its doors in 1913 on the lower level of Grand Central Terminal. Woodrow Wilson was President, the United States was on the threshold of World War I, and Prohibition was just six years away. New York City was slowly emerging as a literary and artistic center, and little “salons” that attracted writers and artists and dilettantes were starting to spring up in Greenwich Village and in other parts of the city. The resplendent new Grand Central Terminal opened its doors that year too, on the site of what formerly had been the old and rundown train depot. People flocked to see the new terminal that was then as now considered an engineering marvel. For almost 60 years the old Oyster Bar remained a landmark. But if the truth be known, the long-lived acceptance of the restaurant was based more on its being located at the hub of America’s long-haul passenger train system than on excellence. With the decline of the long-haul passenger train system, came the decline of the restaurant. It had no position among New York restaurants, and while thousands of commuters passed by everyday, very few went inside to eat.In 1974, when I was approached by the New York Metropolitan Transit Authority to take it over, the old restaurant had been bankrupt and empty for two years, having become in its last days not much more than a sad, old coffee shop. Reluctantly, I inspected what remained of its former grandness. The elegant marble columns you see in the restaurant today were then painted aquamarine over wallpaper. The wall covering was yellow Cello-tex™. The furniture was upholstered yellow, in unsettling contrast with the red table cloths. Despite the obvious drawbacks and failures of the old restaurant, I thought that if we could develop a strong merchandising concept, the 440 seat capacity had real potential. But it would be up to us to invent a new restaurant—from menu to decor—which would make us a destination restaurant. Today's customer of the Grand Central Oyster Bar and Restaurant can hardly imagine that the old Oyster Bar, while its title suggested seafood, was not, in fact, a seafood restaurant. Its oyster stew had become famous, but the rest of the menu could best be described as "continental." Our job of invention would start from scratch—but seafood it would be. To prepare for the decision, my wife and I toured the best-known seafood restaurants in Manhattan, Brooklyn, New Jersey, and the rest of the metropolitan area, and they were invariably full-even when the cuisine was ordinary. That is what decided me to take a chance-the same kind of chance I had taken with restaurants such as the Forum of The Twelve Caesars, the Rainbow Room, the Four Seasons, and Gallagher’s. And so, in 1974, I entered into a lease with the MTA, and embarked on inventing the Grand Central Oyster Bar & Restaurant. The sine qua non of our hoped-for success was that we would need a network of the best suppliers, and my wife, Marlene and I personally sought it out. In Maine we searched for lobster. In Gloucester, Massachusetts, for the best fish from the Grand Banks; in Virginia, for oysters and crabs from Chesapeake Bay. To this day, the Grand Central Oyster Bar & Restaurant continues to cultivate and reach out to a great number of international suppliers, ranging from large corporations to individual fishermen, with whom over the years we nave developed a privileged relationship. A great american seafood restaurant"
Confident that we had ample access to the freshest seafood, our next step was to test our menu in our own kitchens. And so we spent a tremendous amount of time deciding not only what to have on the menu but on methods of preparation. Even an apparently basic technique like broiling was subject to the closest of scrutiny. But whatever we prepared, we wanted our hallmark to be the best, fresh fish available presented in a bright, clean, manner. Because we aspired to be a great American seafood restaurant, we set out to develop a suberb American white wine list. As carefully as we had sought out our seafood suppliers, that is how exhaustively we selected our wine wholesalers and vintners, who, to this day, have named the white wine cellars of the Grand Central Oyster Bar among the best in the country. We won The Brotherhood of the Knights of the Vine “Gold Vine Award” in 1978 and 1979. We began serving wine by the glass in 1993, offering choices from among 70 different wines. ‘The Wine Spectator” honored us with its Award of Excellence in 1996. And, yes, we do serve excellent red wines also. Our success did not happen over night. But over the years we have more than quadrupled our business, which is proof that we have been pleasing our guests and benefiting from the best kind of support any restaurant can ever get: word-of-mouth. In this marketplace a restaurant opens and gets a lot of play, but what happens a year later? What happens 20 years later? To have flourished for these 20 years, that is success. Old and new friends come back regularly—some of them every day—for some of the 25 or 30 varieties of oysters we carry fresh daily or a favorite dish that they insist doesn’t taste the same anywhere else. The Oyster Bar & Restaurant with its high, vaulted ceiling and the architectural grandness of an age gone by has an ambiance now that makes it different from any other restaurant in the world, and since people enjoy our cuisine, they come back again and again.